Aristotle famously said that excellence is an art won by training and habituation. We do not act rightly because we have virtue or excellence, but we rather have those because we have acted rightly. We are what we repeatedly do. Excellence, then, is not an act but a habit. The 7 Habits of Highly Effective People is a book which has transformed the lives of millions of people from all walks of life. It has been a best-selling book for 25 years and even till today, many high achievers still credit their successes to the seven habits that they learned in the book. The 7 Habits of Highly Effective People has sold more than 25 million copies worldwide since its first publication in 1989. The audio version became the first non-fiction audio-book in US publishing history to sell more than one million copies. P.S. 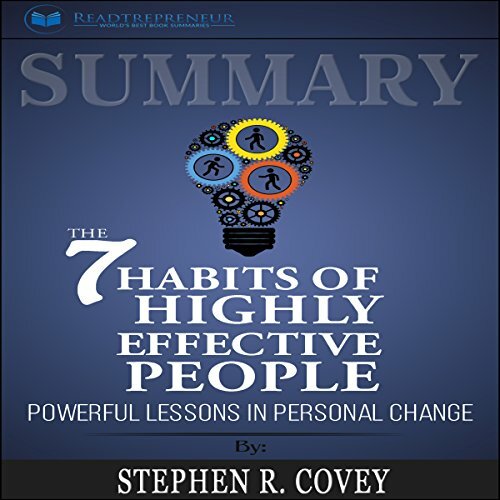 The 7 Habits of Highly Effective People is a non-fluff book unlike other books, and goes straight to the seven habits which are powerful lessons in personal change. This book has literally helped to change my life! I couldn't be more grateful. I have started developing a daily routine and morning ritual using the wisdom contained in these pages. I really like how the author focuses on character building over just doing the right things. What really matters is your character and your mindset, and this book is helping me become a better men. This summary not only makes me want to read the next page, but actually put what it conveying into action. You get thought provoking questions, clear actionable steps, and truly amazing insight.That can be applied in real Life. I am thrilled to have put myself within this information and am very grateful to this summary.. this book changing the lives and opinions of people and it is absolutely fantastic to have the sense of this type of freedom! very useful .. I really enjoyed the book. Mostly due to the author's explanations of the concepts, as well as His good humor.. If you are ready to receive and apply the concepts in this book it will truly be life changing for you! We will look at some of the great failures and successes that resulted when using 7 Habits of Highly Effective People and understand why some people are excellent decision-makers while others are terrible at it. With this Summary, we will understand the factors that matter which will help us make the best possible decisions and make good snap judgments. This is all about The short introductions between the book excerpts are a good idea and very helpful. You have to be ready for this book but if you have the willingness and maturity to understand it, it will change your life. timeless principles explained simply. The discussion on going from personal level of effectiveness to greatness! The narrator showed his ability of The expressions of speech, first hand knowledge from the master and above all a great well paced peep into a great way to organize one's self and beyond. Thanks for this Summary..